Do you know your diapason from your dulcet treble? Would you recommend unisonal duplication of manual stops and couplers? Do you approve of Robert Hope-Jones’s innovations? To whom would you attribute the introduction of the ‘Melody attachment’? 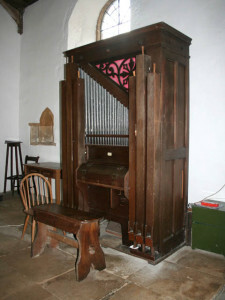 My great-grandfather, Thomas Casson, designed church organs at the end of the 19th and beginning of the 20th century. I have reached the chronological point in writing up the history of his family when he became so obsessed with persuading the musical establishment of the value of his reforms, that he threw up his respectable job as a bank manager, moved his family from Wales to London to take over an organ-building company there and bankrupted himself in the process. Three questions arise: how am I to gain an understanding of his inventions? how am I to to communicate their significance to a non-specialist reader? how much needs to be included to give a clear picture of his family’s life during this period? As I leaf through his pamphlets – The Modern Organ, Reform in Organ Building, The Pedal Organ: Its History, Design and Control, Development of the Resources of the Organ – I am quickly bogged down in technicalities. Yet, by careful perusal of these documents, and of comments by others in the field of organ-design, I begin to get a glimmering idea how some his innovations increased the musicality of what he liked to call ‘the king of instruments’ , and of how the ‘positive organs’ in which he specialised in the second half of his organ-designing career allowed many small churches all over the world to instal an instrument of much greater musical potential than had been on offer previously. Despite much rebuilding, many of these still exist. Only last summer, visiting a little church in North Wales recommended by Simon Jenkins, I found one, still carrying its plaque: “The Positive Organ Company, Casson’s Patent’. (At that time he could not ‘own’ a company, because of the bankruptcy. ) They can also be found as far afield as New Zealand and California. One way to explain his inventions is to put words into his mouth that he might have used to describe to a child how an organ works. Gradually perhaps, by that method, I can build up an understanding in the minds of my readers fairly painlessly. His obsession had a major impact on family life. At first he dreamt of creating huge instruments of greater power than anyone could imagine. It was his wife who gently persuaded him towards the small ‘positive organs’ that finally restored his fortune and made his name. I see the late Victorian passion for larger and larger organs – forgive the sexual innuendos this subject inevitably brings with it – and the fierce rivalries that developed between various different individuals concerned with such things, as running parallel to the national competitive empire-building that would lead to cataclysmic war just a few years after Thomas Casson’s death. I am starting to write a history of the Positive Pipe Organs that were imported into New Zealand. Currently, I have a list of 55 instruments, 7 of which were built and imported before your Gt. Grandfather died. As part of my article will be a biography of Thomas Casson and reference to his family (parents, siblings and children), is there some way of contacting you directly? As a teaser, I have come across an article that references who Thomas had been visiting and who was walking with him when he died in Brentford.